I love pizza. When I am in the states I love a greasy slice of pepperoni eaten on the boardwalk. Here in Rome I love a quick snack of pizza bianca stuffed with mortadella, I love thin crusted Roman pizza, and I will travel on trains and boats for soft crusted Neapolitan pizza. So when I noticed a new place on the eclectic food haven that is via Urbana I was hopeful that this was another good adoption to the neighborhood. Like my beloved Grotto pizza slices in Rehoboth this pizza originated as a beachside snack in the Abruzzo town of Pescara. 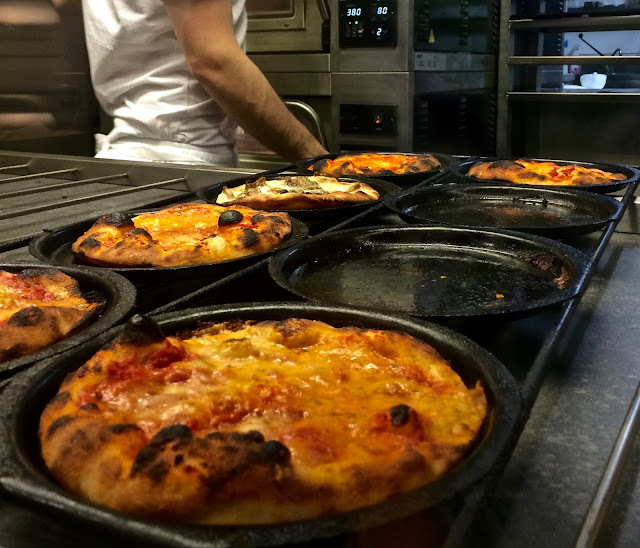 They are the perfect combination of the daytime pizza al taglio, square slices of pizza that are cut to order, and the nighttime pizza tondo, the wood oven fired round pizzas that are only available in Rome for dinner (with the notable exception of Emma.) They are a very cute, personal pan size. Small enough to order more than one. 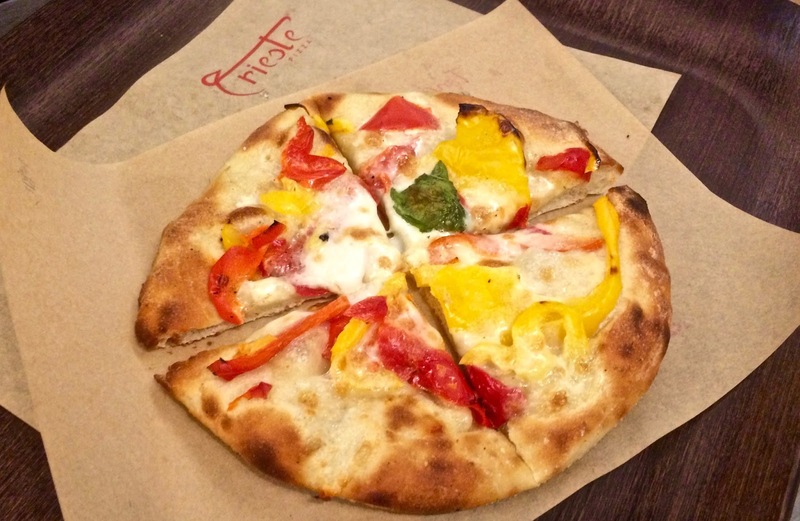 At the suggestion of the very friendly, polyglot, staff we tried the traditional margherita, one with mozzarella and roasted bell peppers and my favorite of the three, a spicy pizza topped with broccoli rabe (friarelli) and sausage. 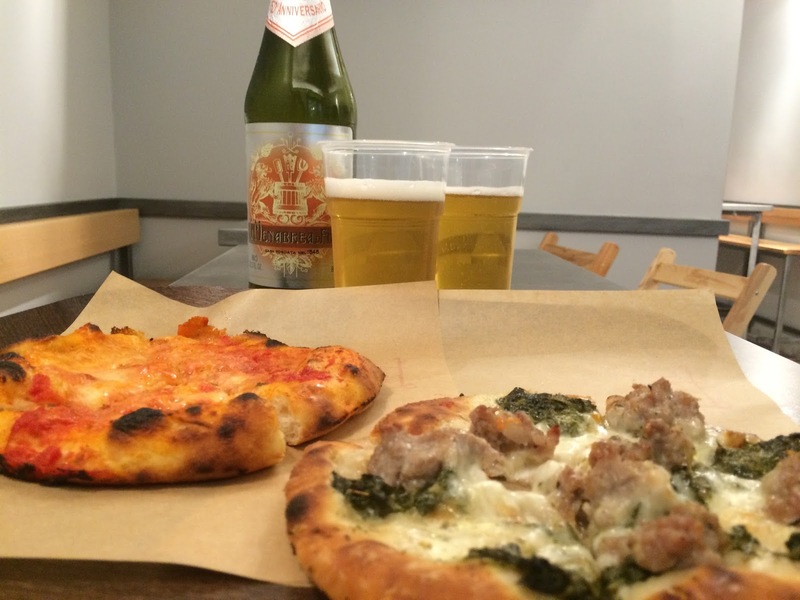 There is a nice beer selection and best of all, plenty of space to sit and enjoy your pizza in a large space next door. Pizza Trieste is open from late morning until well past midnight on the weekends, perfect for whenever a pizza craving strikes.